US wines have struggled with exchange rates and less than favourable trading conditions with Europe in recent years. The massive brands – the Blossom Hills and Gallos – have employed economies of scale to win and maintain a big market share, somewhat distorting the truth about sales of Californian wines in the UK. Certainly, for top-end wines, there has been a perception that the fine wines of Napa, Sonoma and other premium regions were undoubtedly of excellent quality, but prices were steep.But as UK exchange rates have begun to swing against the Euro, it could be that premium US wines are back in the frame as delivering good value for money. To celebrate the 4th of July, I cracked open two wines from Independent, family-owned producers in California’s Napa Valley. Jack Cakebread bought an established property in Rutherford over 30 years ago, establishing his eponymous label. Jack’s son, Bruce, was head winemaker until 2002 when he took over the Presidency of the company from his father, leaving former assistant winemaker Julianne Laks in charge. Cakebread is somewhat of a Sauvignon Blanc specialist – an unusual thing in Napa – and this 2007 bottling sees a little oak ageing making it more of a Graves than a Sancerre style. The nose is fresh and yet creamy, with a touch of smoky vanilla to ripe melony fruit, with a nice little suggestion of something green and grassy in the background. The palate is quite broad and generous, with the oak spicily evident and a powerful mid-palate of lanolin-rich, melon fruit. The acidity is good, with a twist of lemon and some minerality, and it is quite long and well-balanced. 90/100. £17.95, Corney & Barrow. See all stockists of Cakebread Sauvignon Blanc on wine-searcher.com. Three generations of the Heitz family are involved in the business, Joe and Alice Heitz acquirng their 160-acre ranch in St Helena in 1964. This Cabernet was aged for one year in large, American oak tanks, followed by two more years of ageing in small Limousin oak barriques. It has a plush, opulent nose, with a pleasantly minty and eucalypt character over very ripe, deep plum and blackcurrant fruit. There’s a great sense of ripeness with a hint of bloody game. On the palate the sweetness of the fruit floods the mid-palate, but the cedary, smoky character of the oak fills-in around the fruit, and plenty of tobacco and spice notes add interest. The tannins are fairly gentle, but along with good acidity add a bit of savoury, dry cut on the finish which is long and focused. Classy stuff this. 91/100. £30.39 everywine.co.uk. 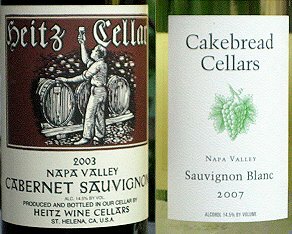 See all stockists of Heitz Cabernet on wine-searcher.com.